By ROBERT McG. THOMAS, Jr.
Walter J.Addems, a pioneering aviator who built his first plane in 1916 and his last one in the 1960's, but only after he had barnstormed across the nation and flown the mail in the 1920's, trained pilots in the 1930's and served as director of flight operations for United Airlines until the 1950's, died on Nov. 21 at a hospital in Palo Alto, Calif. He was 98 and for all his love of aviation, had not flown since the 1980's. To suggest that Mr. Addems was born with a yen to fly would be an exaggeration. It wasn't until he was almost 5 years old that the Wright Brothers made their first flight. And it wasn't until he was in high school that Mr. Addems, a native of Loda, Ill., who grew up in nearby Kankakee, got around to building his first plane, a glider that he put together from plans in the magazine Aviation Week. His mother sewed together the pieces of muslin he stretched over the wooden struts, and cooked up a cauldron of starch to provide the requisite stiffening. 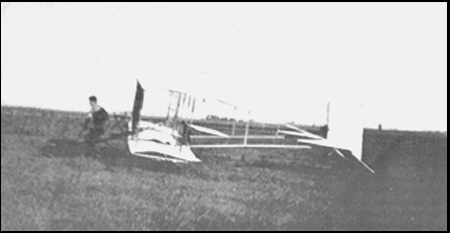 Then, on July 15, 1916, with a friend towing him behind an Oakland touring car in a pasture south of town, Mr. Addems made it aloft. He soared perhaps 15 feet above the pasture for an admittedly short hop that ended when he hit a fence and landed on his hands and knees. But he had flown alone in time to qualify for membership in an exclusive club: the Early Birds, 598 men and women who had flown solo, some in hot air balloons, before Dec. 17, 1916. The 1916 date was critical. When the organization was formed in 1928, the 13th anniversary of the Wright Brothers flight was chosen as the cut-off date for members, separating the true aviation pioneers from the Jenny-come-latelies who flocked to the skies by the hundreds in World War I. Although many Early Birds dropped out of aviation almost as soon as they made what became their qualifying solo flights, once Mr. Addems tasted the joy of the sky he hardly wanted to be anywhere else. Over the next several years, he bought, built and flew just about every famous plane of his era, among them the Curtiss JN-4 trainer, the World War I Jenny and a Thomas-Morse Scout, or Tommy. Before his passion for aviation became an obsession, however, Mr. Addems, a champion high school athlete whose track and field exploits attracted the attention of the University of Chicago football coach, Amos Alonzo Stagg, made what amounted to a double detour, first a semester at the University of Illinois and then a stint in the Army. 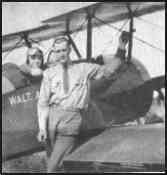 After a year away from flying, Mr. Addems, who had tried to enlist as a Signal Corps pilot but was routed to an artillery unit instead, decided he had had enough of formal education. Following his family to Judd, Iowa, in 1920, he haunted the local airstrip, honing his flying skills, and was soon off barnstorming, participating in air shows, becoming a familiar figure at Checkerboard Field in Maywood, Ill., the Chicago area flying mecca, and taking passengers aloft for $5 a head. When a pretty schoolteacher, Genevieve Mongeau, caught his eye, he would buzz her country schoolhouse in his Tommy, land in a nearby field and then fly her home. In the era of the flivver and the rumble seat, his courtship was inspired: The Tommy was a single-seater and Miss Mongeau had no choice but to sit on his lap. Not that she seemed to mind. The couple were married in 1925 and stayed married until her death 70 years later. With a wife to support, Mr. Addems gave up barnstorming and began flying mail from Chicago to Milwaukee for a fore-runner of Northwestern Airlines. In 1927, he switched to the Chicago-Cleveland route of the fledgling National Air Transport and stayed on when it became the eastern wing of United Airlines in 1931. With the Postal Service offering a bonus for night deliveries, Mr. Addems was a pioneer in testing instrument flying equipment, becoming so proficient that the self-taught pilot was soon training other United fliers. As United's most revered pilot, he became director of flight operations, flying and mapping each new route, testing each new plane and developing many procedures that became industry standards. Although he was always a stickler for safety, Mr. Addems lost his desk job at the Denver headquarters when the airline suffered a series of crashes in the early 1950's. Many of the airline's pilots thought he had been unfairly treated, but Mr. Addems could hardly complain. As a result of the demotion he was returned to the skies, first flying between San Francisco and Tokyo on government contract runs and then becoming chief pilot on United's San Francisco-Hawaii route. 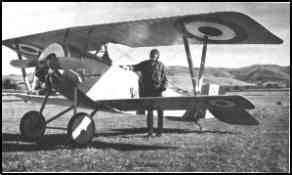 After he reached the mandatory retirement age of 60 in January 1959, Mr. Addems, who had settled in Atherton, Calif., near Palo Alto, had what amounted to a second childhood, building a plane once again, this time a replica, exact to the very Indian design on the fuselage, of the famous Nieuport flown by the Lafayette Escadrille in World War I. Over the next two decades he performed at exhibitions and even had a stint as a movie pilot. At the age of 83, Mr. Addems made his final flight, delivering his Nieuport to San Diego and donating it to the San Diego Aerospace Museum. Mr. Addems is survived by two daughters, Mary Ellen Carr, of Hayward, Calif., and Jean Allgood, of Saratoga, Calif.; six grandchildren, and three great-grandchildren.